Bob Guenzel has been reappointed to a second four-year term on the Ann Arbor Downtown Development Authority board. 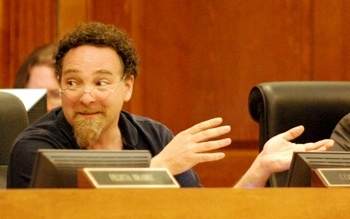 The city council took the action at its Aug. 18, 2014 meeting. The council’s confirmation vote, on the mayoral nomination that had been made at the council’s Aug. 7 meeting, was unanimous, with no discussion. Guenzel was first appointed to the DDA board in 2010 when mayor John Hieftje chose not to reappoint Jennifer Santi Hall. 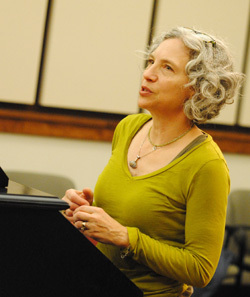 During her tenure on the DDA board, Hall was on occasion sharply critical of the board as a group – for a lack of commitment to open and transparent governance. Washtenaw County board of commissioners working session (May 8, 2014): Washtenaw County commissioners tackled the topic of possibly expanding the road commission board, but reached no consensus at their most recent working session. The road commission board is a three-member entity, and is run independently from county operations. The county board, an elected body that appoints the road commissioners, is enabled under state law to expand the road commission board to five members. The possibility of expansion has been discussed periodically for years, but was always met with resistance – most notably from some of the road commissioners themselves. Commissioners who argued against expansion at this time cited the need for the relatively new road commission board to gain more experience before any changes are made. Arguing in favor of expansion, Conan Smith (D-District 9) scoffed at the idea that the road commission was “some magical institution that needs special treatment.” The only result of leaving the road commission board at three members instead of five is that it will consolidate political power among the three current road commissioners, he said. “Those people who are there longer get to build stronger relationships, get deeper knowledge, and they have that ability then to leverage that knowledge and political authority to their own ends.” Adding two more road commissioners will bring more diversity to the governance of that organization, he argued, saying it’s something that should have been done years ago. Smith said it’s crucial to bring more voices to bear on one of the most contentious, critical issues that the county will face in a long time – the management of the local transportation network. Over the past decade, he said, the people who’ve served as road commissioners haven’t “had the wherewithal to tackle this issue in a way that presents a comprehensive solution.” Given the changing nature of transportation, the economy and economic development, the most important thing that’s needed is a greater diversity of voices at the table, Smith concluded. Smith, Yousef Rabhi (D-District 8) and Felicia Brabec (D-District 4) indicated that they support expansion. Dan Smith (R-District 2) and Alicia Ping (R-District 3) were inclined to keep a three-member road commission board at this time, while two other commissioners – Kent Martinez-Kratz (D-District 1) and Andy LaBarre (D-District 7) – seemed on the fence, or leaning toward picking up the issue at a later date. Commissioners Ronnie Peterson (D-District 6) and Rolland Sizemore Jr. (D-District 5) did not attend the May 8 working session. The meeting was attended by one of the three current road commissioners, Barb Fuller. She did not formally address the board. The issue of possible expansion comes in the broader context of discussions about whether to change the structure of the road commission – by absorbing the commission into county operations. 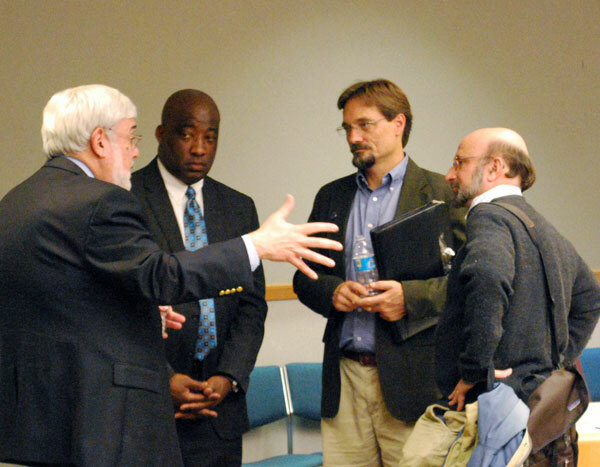 At their Oct. 2, 2013 meeting, county commissioners created a seven-member subcommittee to “explore partnerships and organizational interactions with the Washtenaw County Road Commission.” The subcommittee made recommendations to the board earlier this year that called for leaving the road commission as an independent entity. The subcommittee did not make a recommendation about expanding the road commission from three to five members, calling it a political decision that the county commissioners should make. The board accepted the subcommittee’s recommendations at their May 7, 2014 meeting, but have not yet made a decision about expansion. At its Feb. 19, 2014 meeting, the Washtenaw County board of commissioners approved several appointments to various county board and committees. Nominations were brought forward by board chair Yousef Rabhi (D-District 8). Several openings remain and will be reposted on the county’s website. On a 6-5 vote of the Ann Arbor city council, the appointment of Al McWilliams to the Ann Arbor Downtown Development Authority board has been confirmed. The action came after his nomination had been withdrawn by mayor John Hieftje in the middle of deliberations at the council’s previous meeting, on Sept 3, 2013. At that meeting, the nomination appeared to be in doubt, as two councilmembers were absent – Jane Lumm (Ward 2) and Marcia Higgins (Ward 4). The vote from Higgins was one of the six that was in favor of McWilliams at the Sept. 16, 2013 meeting. Ann Arbor Transportation Authority board member Jesse Bernstein attended his final regular meeting of the board on April 18, 2013. The following month, on May 16, his board colleagues approved a resolution acknowledging his five-year term of service, which began on June 16, 2008. Bernstein was not able to attend the meeting. Ann Arbor city council meeting (Aug. 20, 2012): City council actions finalized the set of ballot questions for Ann Arbor voters on Nov. 6: A public art millage will join the Ann Arbor District Library’s bond proposal and the city of Ann Arbor’s parks maintenance and capital improvements millage on the ballot. 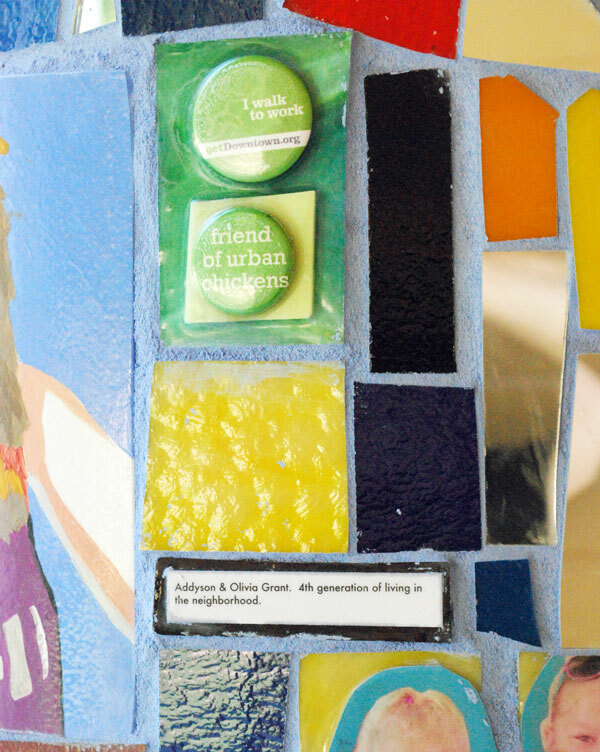 The public art millage would be levied at a rate of 0.1 mill, which would raise around $450,000 from Ann Arbor taxpayers annually. Passage of the public art millage would, according to the corresponding charter amendment, suspend the city’s public art funding mechanism embedded in the Percent for Art ordinance – but only for the duration of the four-year millage. A selling point of the millage, compared to the current Percent for Art program, is that millage money could be used more flexibly than money set aside under the Percent for Art program. The Percent for Art ordinance requires that 1% of all city capital projects be set aside for art. But this funding mechanism carries with it a legal requirement that art paid for through the program be in some sense “monumental” art that is permanent. Performance art or temporary installations would not qualify under the current program. A proposal from Jane Lumm (Ward 2) to begin the process of revising the Percent for Art ordinance in advance of the millage vote got little traction from the council. Lumm indicated that she wanted to offer voters a clear choice – that unless the millage were approved, public funding for art would disappear. But her resolution was voted down, with additional support only from Stephen Kunselman (Ward 3) and Mike Anglin (Ward 5). The majority of councilmembers felt that such a move was “premature.” Mayor John Hieftje indicated that he was open to a scenario in which the millage passed, the tax was levied for four years (which would generate roughly $1.8 million in money that could be spent flexibly), but then was not offered to voters for renewal after four years, which would mean an automatic reversion to the current Percent for Art program. In other business, the council declined to take action on two pieces of land at opposite ends of the downtown – 414 N. Main St. (site of the old St. Nicholas Church), and 350 S. Fifth Ave. (the former YMCA lot). The council rejected a proposal to begin the rezoning process for the St. Nicholas Church property – in advance of a public auction of the land starting Sept. 6. The council also declined to support a directive to the city administrator to prepare for disposition of the old Y lot, citing an ongoing planning process for the area of downtown Ann Arbor that includes the city-owned parcel. That process – Connecting William Street – is being led by the Ann Arbor DDA under direction from the city council. The council transacted a mixed bag of other business, including approval of a collaborative effort with Washtenaw County to handle towing. The council also approved the final grant contract necessary for completing an environmental study in connection with a runway extension at the Ann Arbor municipal airport. The council rejected a proposal from Comcast for a new franchise agreement, opting instead to allow the current arrangement to stay in place at least through the end of its term in 2017. 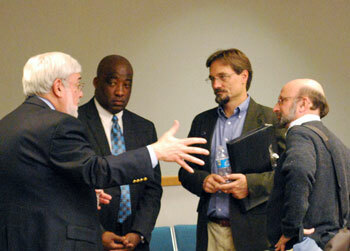 The meeting ended around midnight with jostling among councilmembers on the issue of mayoral appointments. Prompting the discussion was the reappointment of Sandi Smith (Ward 1) to the board of the Ann Arbor DDA. Kunselman and Lumm voted against the reappointment, objecting to Smith’s dual service on the city council and the DDA board. Smith was originally appointed to the board before her election to the council in 2008 and is not seeking re-election this term. Other councilmembers defended Smith’s selection. An additional member has been added to the Ann Arbor taxicab board – Michael Benson. The addition will allow the body to achieve a quorum of three out of five voting members for its meetings. It has not been able to do that since July 2012, when Tim Hull resigned because he took a job on the west coast and could not continue to serve. Benson was added to the board in a one-step confirmation process – in a vote taken by the city council at its Aug. 20 meeting. Ordinarily, nominations to a board or a commission are first announced at a city council meeting, then confirmed by a council vote at a subsequent meeting. 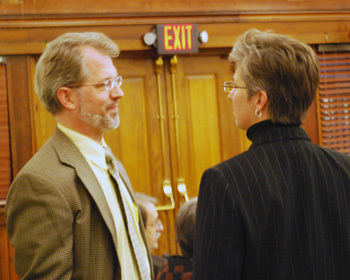 At the Dec. 5, 2011 Ann Arbor city council meeting, mayor John Hieftje nominated the city’s transportation program manager, Eli Cooper, to serve on the board of the Ann Arbor Transportation Authority. On confirmation by the city council, Cooper would fill the vacancy on the AATA board left by Sue McCormick. At the Aug. 15, 2011 Ann Arbor city council meeting, mayor John Hieftje placed nominations before the city council for appointments to the Ann Arbor Downtown Development Authority board. John Mouat and Joan Lowenstein were nominated for reappointment, but Gary Boren, who was elected this July by his colleagues as chair of the DDA board for the coming year, was not reappointed. 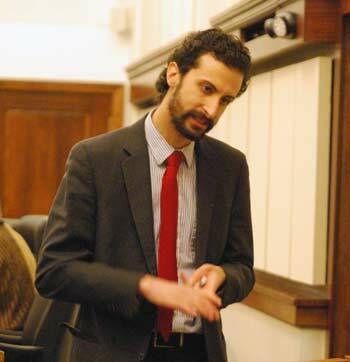 Nominated to replace Boren is Nader Nassif. Ann Arbor public market advisory commission meeting (March 10, 2011): A nighttime farmers market in Ann Arbor is in the works as a pilot program to start on Wednesdays in July. Market manager Molly Notarianni is proposing a producers-only market from 4:30-8:30 p.m., operating as a separate entity from the existing Saturday and Wednesday daytime markets. The significance of having a separate application process is that it would eliminate the seniority system that exists at the other markets. The seniority system makes it difficult for new vendors to get spots in those markets. 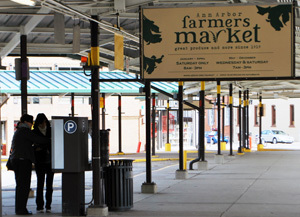 Members of the city’s public market advisory commission seemed generally supportive of the idea – they’ll likely weigh in officially at their meeting in May. The group also discussed revisions to the market vendor application form – including a proposed requirement for lease verification. The commission is still short two members, a situation that has presented some challenges in the last few months. All three current members need to attend in order to achieve a quorum, and scheduling difficulties have led to cancellation of several of their monthly meetings. The March meeting was rescheduled from Tuesday to Thursday of last week – because of that change, the meeting was not broadcast by Community Television Network (CTN). Time to Expand Greenbelt Boundary? Ann Arbor greenbelt advisory commission meeting (Nov. 10, 2010): At this month’s meeting, commissioners unanimously approved forming a subcommittee to explore possible changes to the existing boundary of the greenbelt district. Led by GAC vice chair Dan Ezekiel, the group will look for ways to protect properties that might be appropriate for the greenbelt, but that lie just outside of the current district. A similar effort in 2007 resulted in bumping out the boundary by a mile. Noting that this was the second time they’d looked at the issue, GAC chair Jennifer S. Hall suggested exploring other ways that the greenbelt program might achieve the same result, but that wouldn’t involve regularly moving the program’s fixed boundary. Another theme of the meeting was local food. Two local food advocates – Lisa Gottlieb and Jeff McCabe – gave a presentation about their work raising money to fund construction of hoop houses at local farms. Gottlieb and McCabe host the weekly Selma Cafe, a breakfast gathering every Friday morning at their home that regularly draws more than 120 people. Commissioner Dan Ezekiel praised their work, and GAC chair Jennifer S. Hall expressed the hope that they could find ways to work together in the future. Also during Wednesday’s meeting, commissioners voted to recommend an agreement with Webster Township, which is offering to contribute $50,000 to the purchase of development rights for the 146-acre Whitney farm. The city council has already agreed to pay $707,122 toward that purchase. Greenbelt program manager Ginny Trocchio reported that the city has closed on the 51-acre Gould property, adjacent to the recently protected 286-acre Braun farm – both farms are located in Ann Arbor Township. The Braun acquisition bumped the greenbelt program over the 2,000-acre mark, she said – about 2,200 acres are now part of the greenbelt. The Brauns have agreed to open their property for a celebration in the coming months. In other action, GAC voted unanimously to set public commentary rules in alignment with other city boards and commissions. And Hall noted that two vacancies will be opening up next year on GAC – she encouraged local residents who might be interested in serving on the commission to attend some of their meetings, or talk to their city councilmember about their interest. Ann Arbor Public Art Commission meeting (Sept. 14, 2010): A proposed mural program, still in its formative stages, is being developed by AAPAC’s newest commissioner, Jeff Meyers, as a way to generate more public art in the community. 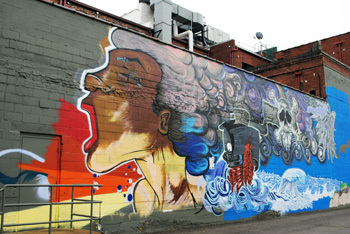 At Tuesday’s meeting, Meyers presented a draft proposal for the effort, which aims to fund two murals during the current fiscal year from the city’s Percent for Art program, with the goal of eventually creating four murals each year. The commission also got an update on bids from potential fabricators of the water sculpture designed by Herbert Dreiseitl at the new municipal center. 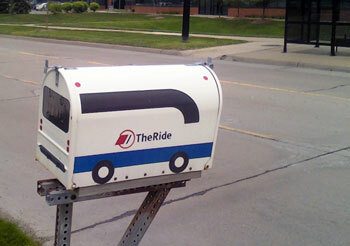 Two companies made bids, and both came in over the $458,000 fabrication budget. (That’s part of the total $737,820 project budget, not including design fees.) Project manager Ken Clein of Quinn Evans Architects is working with the firms to lower the bids before making a selection. AAPAC members had also hoped to hear good news about filling one of two vacancies on the commission. Lee Doyle, a member of the University of Michigan President’s Advisory Committee for Public Art who also oversees the UM Film Office, was interested in joining AAPAC. But on Tuesday, commissioners were told that mayor John Hieftje, who makes nominations to the commission, instead wants to appoint someone who resides in Ann Arbor – Doyle lives outside the city. This news prompted a discussion of AAPAC’s role in soliciting people to serve. Ann Arbor Transportation Authority board meeting (May 12, 2010): With the expiration of two board members’ terms on May 1, and no replacement finalized for either, an absence further reduced the now five-member AATA board to four at its regular monthly meeting on Wednesday. The meeting had been rescheduled from its usual slot on the second-to-last Wednesday of the month to avoid additional absences. The four board members who were present listened to a glowing review of the AATA from McCollom Management Consulting, which had been hired to perform an organizational audit.